"Instant freeze" redirects here. For the Batman episode, see Instant Freeze. Freeze drying, also known as lyophilisation or cryodesiccation, is a low temperature dehydration process  which involves freezing the product, lowering pressure, then removing the ice by sublimation. This is in contrast to dehydration by most conventional methods that evaporate water using heat. Freeze drying results in a high quality product because of the low temperature used in processing. The original shape of the product is maintained and quality of the rehydrated product is excellent. Primary applications of freeze drying include biological (e.g. bacteria and yeasts), biomedical (e.g. surgical transplants), and food processing (e.g. coffee) and preservation. The first application of the freeze-drying process were in the Andes where Indigenous people would take low-land tubers up to high altitudes and leave them to freeze. The potatoes were squashed to facilitate the water loss but when left to freeze at night and exposed through the days, the mash would lose its water while the nutrients were preserved through the lyophilization process. This resulted in a product called chuño which was a long shelf life food eaten well past its seasonal availability and also stored for emergency rations, if needed. Freeze drying as an industrial process began in as early as 1890 by Richard Altmann who devised a method to freeze dry tissues (either plant or animal), but went virtually unnoticed until the 1930s. In 1909, Shackell independently created the vacuum chamber by using an electrical pump. However, no further data on freeze drying was documented until Tival in 1927 and Elser in 1934 had patented freeze drying systems with improvements to freezing and condenser steps. A significant turning point for freeze drying occurred during World War II. Blood plasma and penicillin were needed to treat the wounded in the field, and because of the lack of simultaneous refrigeration and transport, many serum supplies were spoiling before reaching their intended recipients. The freeze-drying process was developed as a commercial technique that enabled blood plasma and penicillin to be rendered chemically stable and viable without having to be refrigerated. In the 1950s-60s, freeze drying began to be viewed for its multi-purpose application to both pharmaceuticals and food processing. Freeze-drying products became a major commodity for astronauts and military food rations. What began for astronaut crews as tubed meals and freeze-dried snacks that were difficult to rehydrate, they are now able to enjoy warm hot meals while in space by improving the easability for rehydrating freeze-dried meals with water. As technology and food processing improved NASA looked for ways to provide a complete nutrient profile while reducing crumbs, disease-producing bacteria, and toxins. The complete nutrient profile was improved with the addition of an algae-based vegetable-like oil to add polyunsaturated fatty acids. Polyunsaturated fatty acids are beneficial in mental and vision development, and as it remains stable after space travel can provide astronauts with its added benefits. The crumb problem was solved with the addition of a gelatin coating on the foods to lock in and prevent crumbs. Disease-producing bacteria and toxins were reduced by quality control and the development of the Hazard Analysis Critical Control Point (HACCP) plan, which is widely used today to evaluate food material before, during and after processing. With the combination of these 3 things, NASA could provide safe and wholesome foods to their crews while in space in a freeze-dried meal source. Military rations have also come a long way, from being served spoiled pork and corn meal to beefsteak with mushroom gravy. How rations are chosen and developed are based on acceptance, nutrition, wholesomeness, producibility, cost, and sanitation. Additional requirements for rations include a minimum shelf life of 3 years, be deliverable by air, consumable in worldwide environments, and provide a complete nutritional profile. The new tray rations (T Ration) which has been improved upon by increasing acceptable items and provide high quality meals while in the field. Freeze-dried coffee was also incorporated by replacing spray-dried coffee within the meal, ready-to-eat category. In a typical phase diagram, the boundary between gas and liquid runs from the triple point to the critical point. 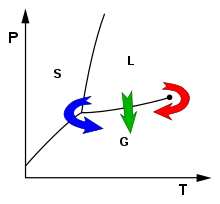 Freeze-drying (blue arrow) brings the system around the triple point, avoiding the direct liquid-gas transition seen in ordinary drying time (green arrow). There are four stages in the complete freeze drying process: pretreatment, freezing, primary drying, and secondary drying. During the freezing stage, the material is cooled below its triple point, the lowest temperature at which the solid, liquid and gas phases of the material can coexist. This ensures that sublimation rather than melting will occur in the following steps. To facilitate faster and more efficient freeze drying, larger ice crystals are preferable. The large ice crystals forms a network within the product which promotes faster removal of water vapor during sublimation. To produce larger crystals, the product should be frozen slowly or can be cycled up and down in temperature in a process called annealing. The freezing phase is the most critical in the whole freeze-drying process, as the freezing method can impact the speed of reconstitution, duration of freeze-drying cycle, product stability, and appropriate crystallization. Amorphous materials do not have a eutectic point, but they do have a critical point, below which the product must be maintained to prevent melt-back or collapse during primary and secondary drying. In the case of goods where preservation of structure is required, like food or objects with formerly-living cells, large ice crystals will break the cell walls which can result in increasingly poor texture and loss of nutritive content. In this case, the freezing is done rapidly, in order to lower the material to below its eutectic point quickly, thus avoiding the formation of large ice crystals. Usually, the freezing temperatures are between −50 °C (−58 °F) and −80 °C (−112 °F). During the primary drying phase, the pressure is lowered (to the range of a few millibars), and enough heat is supplied to the material for the ice to sublime. The amount of heat necessary can be calculated using the sublimating molecules' latent heat of sublimation. In this initial drying phase, about 95% of the water in the material is sublimated. This phase may be slow (can be several days in the industry), because, if too much heat is added, the material's structure could be altered. In this phase, pressure is controlled through the application of partial vacuum. The vacuum speeds up the sublimation, making it useful as a deliberate drying process. Furthermore, a cold condenser chamber and/or condenser plates provide a surface(s) for the water vapour to re-liquify and solidify on. It is important to note that, in this range of pressure, the heat is brought mainly by conduction or radiation; the convection effect is negligible, due to the low air density. The secondary drying phase aims to remove unfrozen water molecules, since the ice was removed in the primary drying phase. This part of the freeze-drying process is governed by the material's adsorption isotherms. In this phase, the temperature is raised higher than in the primary drying phase, and can even be above 0 °C (32 °F), to break any physico-chemical interactions that have formed between the water molecules and the frozen material. Usually the pressure is also lowered in this stage to encourage desorption (typically in the range of microbars, or fractions of a pascal). However, there are products that benefit from increased pressure as well. After the freeze-drying process is complete, the vacuum is usually broken with an inert gas, such as nitrogen, before the material is sealed. Freeze-drying causes less damage to the substance than other dehydration methods using higher temperatures. Nutrient factors that are sensitive to heat are lost less in the process as compared to the processes incorporating heat treatment for drying purposes. Freeze-drying does not usually cause shrinkage or toughening of the material being dried. In addition, flavours, smells, and nutritional content generally remain unchanged, making the process popular for preserving food. However, water is not the only chemical capable of sublimation, and the loss of other volatile compounds such as acetic acid (vinegar) and alcohols can yield undesirable results. Pharmaceutical companies often use freeze-drying to increase the shelf life of the products, such as live virus vaccines, biologics and other injectables. By removing the water from the material and sealing the material in a glass vial, the material can be easily stored, shipped, and later reconstituted to its original form for injection. Another example from the pharmaceutical industry is the use of freeze drying to produce tablets or wafers, the advantage of which is less excipient as well as a rapidly absorbed and easily administered dosage form. 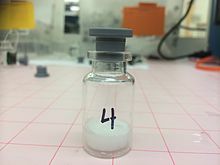 Freeze-dried pharmaceutical products are produced as lyophilized powders for reconstitution in vials and more recently in prefilled syringes for self-administration by a patient. Examples of lyophilized biological products include many vaccines such as Measles Virus Vaccine Live, Typhoid Vaccine, and Meningococcal Polysaccharide Vaccine Groups A and C Combined. Other freeze-dried biological products include Antihemophilic Factor VIII, Interferon alfa, anti-blood clot medicine Streptokinase, and Wasp Venom Allergenic Extract. Many biopharmaceutical products based on therapeutic proteins such as monoclonal antibodies require lyophilization for stability. Examples of lyophilized biopharmaceuticals include blockbuster drugs such as Etanercept (Enbrel by Amgen), Infliximab (Remicade by Janssen Biotech), Rituximab, and Trastuzumab (Herceptin by Genentech). Freeze-drying is also used in manufacturing of raw materials for pharmaceutical products. Active Pharmaceutical Product Ingredients (APIs) are lyophilized to achieve chemical stability under room temperature storage. Bulk lyophilization of APIs is typically conducted using trays instead of glass vials. Dry powders of probiotics are often produced by bulk freeze-drying of live microorganisms such as Lactic acid bacteria and Bifidobacteria. The primary purpose of freeze drying within the food industry is to extend the shelf-life of the food while maintaining the quality. Freeze-drying is known to result in the highest quality of foods amongst all drying techniques because structural integrity is maintained along with preservation of flavors. Because freeze drying is expensive, it is used mainly with high-value products. 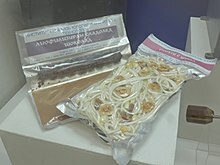 Examples of high-value freeze-dried products are seasonal fruits and vegetables because of their limited availability, coffee, and foods used for military rations, astronauts/cosmonauts, and/or hikers. Because of its light weight per volume of reconstituted food, freeze-dried products are popular and convenient for hikers, as military rations, or astronaut meals. A greater amount of dried food can be carried compared the same weight of wet food. In replacement of wet food, freeze dried food can be easily be rehydrated with water if desired and shelf-life of the dried product is longer than fresh/wet product making it ideal for long trips taken by hikers, military personnel, or astronauts. 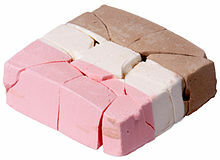 The development of freeze drying increased meal and snack variety to include items like shrimp cocktail, chicken and vegetables, butterscotch pudding, and apple sauce. Coffee contains flavor and aroma qualities that are created due to the Maillard reaction during roasting and can be preserved with freeze-drying. Compared to other drying methods like room temperature drying, hot-air drying, and solar drying, Robusta coffee beans that were freeze-dried contained higher amounts of essential amino acids like leucine, lysine, and phenylalanine. Also, few non-essential amino acids that significantly contributed to taste were preserved. With conventional dehydration, berries can degrade in quality as their structure is very delicate and contains high levels of moisture. Strawberries were found to have the highest quality when freeze dried; retaining color, flavour, and ability to be re-hydrated. In chemical synthesis, products are often freeze-dried to make them more stable, or easier to dissolve in water for subsequent use. In bioseparations, freeze-drying can be used also as a late-stage purification procedure, because it can effectively remove solvents. Furthermore, it is capable of concentrating substances with low molecular weights that are too small to be removed by a filtration membrane. Freeze-drying is a relatively expensive process. The equipment is about three times as expensive as the equipment used for other separation processes, and the high energy demands lead to high energy costs. Furthermore, freeze-drying also has a long process time, because the addition of too much heat to the material can cause melting or structural deformations. Therefore, freeze-drying is often reserved for materials that are heat-sensitive, such as proteins, enzymes, microorganisms, and blood plasma. The low operating temperature of the process leads to minimal damage of these heat-sensitive products. In nanotechnology, freeze-drying is used for nanotube purification to avoid aggregation due to capillary forces during regular thermal vaporization drying. In bacteriology freeze-drying is used to conserve special strains. In high-altitude environments, the low temperatures and pressures can sometimes produce natural mummies by a process of freeze-drying. Advanced ceramics processes sometimes use freeze-drying to create a formable powder from a sprayed slurry mist. Freeze-drying creates softer particles with a more homogeneous chemical composition than traditional hot spray drying, but it is also more expensive. A new form of burial which previously freeze-dries the body with liquid nitrogen has been developed by the Swedish company Promessa Organic AB, which puts it forward as an environmentally friendly alternative to traditional casket and cremation burials. Freeze-drying is viewed as the optimal method of choice for dehydration because of the preservation of quality, meaning characteristics of the food product such as aroma, rehydration, and bioactivity, are noticeably higher compared to foods dried using other techniques. Shelf-life extension is a result from low processing temperatures in conjunction with rapid transition of water through sublimation. With these processing conditions, deterioration reactions, including nonenzymatic browning, enzymatic browning, and protein denaturation, are minimized. When the product is successfully dried, packaged properly, and placed in ideal storage conditions the foods have a shelf life of greater than 12 months. If a dried product can not be easily or fully rehydrated, it is considered to be of lower quality. Because the final freeze dried product is porous, complete rehydration can occur in the food. This signifies greater quality of the product and makes them ideal for ready-to-eat instant meals. Due to the low processing temperatures and the minimization of deterioration reactions, nutrients are retained and color is maintained. Freeze-dried fruit maintains its original shape and has a characteristic soft, crispy texture. Since the main method of microbial decontamination for freeze drying is the low temperature dehydration process, spoilage organisms and pathogens resistant to these conditions can remain in the product. Although microbial growth is inhibited by the low moisture conditions, it can still survive in the food product. An example of this is a hepatitis A outbreak that occurred in the United States in 2016, associated with frozen strawberries. If the product is not properly packaged and/or stored, the product can absorb moisture, allowing the once inhibited pathogens to begin reproducing as well. The cost for freeze-drying is about 5 times more than conventional drying methods, making it not an ideal choice if the value of the product is not increased after processing. However, costs are also variable depending on the product, the packaging material, processing capacity, etc. Also, the cost in terms of energy is highest to perform the sublimation process in comparison to the freezing, vacuum and condensation steps. Silicone oil is the common fluid that is used to heat or cool shelves in the freeze-dryer. The continuous heat/cool cycle can lead to a leakage of silicone oil at weak areas that connect the shelf and hose. This can contaminate the product leading to major losses of food product. Hence, to avoid this issue, mass spectrometers are used to identify vapors released by silicone oil to immediately take corrective action and prevent contamination of the product. There are many types of freeze-dryers available, however, they usually contain a few essential components. These are a vacuum chamber, shelves, process condenser, shelf-fluid system, refrigeration system, vacuum system, and control system. The chamber is highly polished and contains insulation, internally. It is manufactured with stainless steel and contains multiple shelves for holding the product. A hydraulic or electric motor is in place to ensure the door is vacuum-tight when closed. The process condenser consists of refrigerated coils or plates that can be external or internal to the chamber. During the drying process, the condenser traps water. For increased efficiency, the condenser temperature should be 20 °C (68 °F) less than the product during primary drying and have a defrosting mechanism to ensure that the maximum amount of water vapor in the air is condensed. The amount of heat energy needed at times of the primary and secondary drying phase is regulated by an external heat exchanger. Usually, silicone oil is circulated around the system with a pump. This system works to cool shelves and the process condenser by using compressors or liquid nitrogen, which will supply energy necessary for the product to freeze. During the drying process, a vacuum of 50-100 microbar is applied, by the vacuum system, to remove the solvent. A two-stage rotary vacuum pump is used, however, if the chamber is large then multiple pumps are needed. This system compresses non-condensable gases through the condenser. Finally, the control system sets up controlled values for shelf temperature, pressure and time that are dependent on the product and/or the process. The freeze-dryer can run for a few hours or days depending on the product. Contact freeze dryers use contact (conduction) of the food with the heating element to supply the sublimation energy. This type of freeze dryer is a basic model that is simple to set up for sample analysis. One of the major ways contact freeze dryers heat is with shelf-like platforms contacting the samples. The shelves play a major role as they behave like heat exchangers at different times of the freeze-drying process. They are connected to a silicone oil system that will remove heat energy during freezing and provide energy during drying times. Additionally, the shelf-fluid system works to provide specific temperatures to the shelves during drying by pumping a fluid (usually silicone oil) at low pressure. The downside to this type of freeze dryer is that the heat is only transferred from the heating element to the side of the sample immediately touching the heater. This problem can be minimized by maximizing the surface area of the sample touching the heating element by using a ribbed tray, slightly compressing the sample between two solid heated plates above and below, or compressing with a heated mesh from above and below. Radiant freeze dryers use infrared radiation to heat the sample in the tray. This type of heating allows for simple flat trays to be used as an infrared source can be located above the flat trays to radiate downwards onto the product. Infrared radiation heating allows for a very uniform heating of the surface of the product, but has very little capacity for penetration so it is used mostly with very shallow trays and homogeneous sample matrices. Microwave-assisted freeze dryers utilize microwaves to allow for deeper penetration into the sample to expedite the sublimation and heating processes in freeze-drying. This method can be very complicated to setup and run as the microwaves can create an electrical field capable of causing gases in the sample chamber to become plasma. This plasma could potentially burn the sample, so maintaining a microwave strength appropriate for the vacuum levels is imperative. The rate of sublimation in a product can affect the microwave impedance, in which power of the microwave must be changed accordingly. ^ a b c d e f g h i j Ratti, Cristina (2008-11-21). Advances in Food Dehydration. CRC Press. pp. 209–235. ISBN 9781420052534. ^ a b c d e f g h i j k l m Fellows, P. (Peter) (2017). "Freeze drying and freeze concentration". Food processing technology : principles and practice (4th ed.). Kent: Woodhead Publishing/Elsevier Science. pp. 929–940. ISBN 978-0081005231. OCLC 960758611. ^ Prosapio, Valentina; Norton, Ian; De Marco, Iolanda (2017-12-01). "Optimization of freeze-drying using a Life Cycle Assessment approach: Strawberries' case study". Journal of Cleaner Production. 168: 1171–1179. doi:10.1016/j.jclepro.2017.09.125. ISSN 0959-6526. ^ a b c d e f g Ratti, C (2001). "Hot air and freeze-drying of high-value foods: a review". Journal of Food Engineering. 49: 311–319. ^ Meryman, H. T. (October 1976). "Historical recollections of freeze-drying". Developments in Biological Standardization. 36: 29–32. ISSN 0301-5149. PMID 801137. ^ a b c d e Corver, Jos. "The Evolution of Freeze Drying" (PDF). Innovations in Pharmaceutical Technology. ^ a b c d e "NASA Food Technology: Incredible Edibles from Space" (PDF). ^ "Defense.gov News Article: New Rations in Pipeline for Service Members". archive.defense.gov. Retrieved 2018-05-18. ^ a b c Research, Institute of Medicine (US) Committee on Military Nutrition; Marriott, Bernadette M. (1995). Evolution of Rations: The Pursuit of Universal Acceptance. National Academies Press (US). ^ J. Jeff Schwegman (2009) "Basic Cycle Development Techniques for Lyophilized Products". ^ Hansen, L.L.J. ; et al. (2015). "Freeze-drying of live virus vaccines: A review". Vaccine. 33 (42): 5507–5519. doi:10.1016/j.vaccine.2015.08.085. PMID 26364685. ^ Rey, Louis; May, Joan (2016). Freeze-Drying/Lyophilization of Pharmaceutical and Biological Products (Third ed.). Informa healthcare. ^ "FDA Guideline for the Determination of Residual Moisture in Dried Biological Products" (PDF). US Food and Drug Administration. ^ "Stability evaluation of freeze-dried Lactobacillus paracasei subsp. tolerance and Lactobacillus delbrueckii subsp. bulgaricus in oral capsules". Res Pharm Sci. 2012. ^ a b c Dong, Wenjiang; Hu, Rongsuo; Chu, Zhong; Zhao, Jianping; Tan, Lehe (25 April 2017). "Effect of different drying techniques on bioactive components, fatty acid composition, and volatile profile of robusta coffee beans". Food Chemistry (234). ^ Shishehgarha, F; Makhlouf, J; Ratti, C (Jan 2002). "FREEZE-DRYING CHARACTERISTICS OF STRAWBERRIES". Drying Technology. 20 (1): 131–145. ^ Maugey, M; Neri, W; Zakri, C; Derré, A; Pénicaud, A; Noé, L; Chorro, M; Launois, P; Monthioux, M; Poulin, P (2007). "Substantial improvement of nanotube processability by freeze-drying". J Nanosci Nanotechnol. 7 (8): 2633–2639. doi:10.1166/jnn.2007.855. ^ Bourdoux, Siméon; Li, Dan; Rajkovic, Andreja; Devlieghere, Frank; Uyttendaele, Mieke (2016-09-07). "Performance of Drying Technologies to Ensure Microbial Safety of Dried Fruits and Vegetables". Comprehensive Reviews in Food Science and Food Safety. 15 (6): 1056–1066. doi:10.1111/1541-4337.12224. ISSN 1541-4337. ^ "2016 - Multistate outbreak of hepatitis A linked to frozen strawberries (Final Update) | Hepatitis A Outbreaks | Outbreaks | Division of Viral Hepatitis | CDC". www.cdc.gov. Retrieved 2018-05-20. ^ Meissner, U.; Stahl, Harald; Steinkellner, D. (2011-09-01). "Detection of Silicone Oil Leakages in Freeze Dryers". PDA Journal of Pharmaceutical Science and Technology. 65 (5): 481–485. doi:10.5731/pdajpst.2011.00748. ISSN 1079-7440. PMID 22293837. ^ a b c d e f g Nireesha, GR; Divya, L; Sowmya, C; Venkatesan, N; Niranjan Babu, M; Lavakumar, V (30 October 2013). "Lyophilization/Freeze Drying - An Review". International Journal of Novel Trends in Pharmaceutical Sciences. 3. ^ Lopez-Quiroga, Estefania; Antelo, Luis T.; Alonso, Antonio A. (August 2012). "Time-scale modeling and optimal control of freeze–drying". Journal of Food Engineering. 111 (4): 655–666. doi:10.1016/j.jfoodeng.2012.03.001. ^ Pisano, Roberto; Fissore, Davide; Velardi, Salvatore A.; Barresi, Antonello A. (November 2010). "In-Line Optimization and Control of an Industrial Freeze-Drying Process for Pharmaceuticals". Journal of Pharmaceutical Sciences. 99 (11): 4691–4709. doi:10.1002/jps.22166. Wikimedia Commons has media related to Freeze drying. This page was last edited on 19 April 2019, at 13:18 (UTC).